Do you remember the H1N1 swine flu that made tens of millions sick and killed thousands of people in 2009? Well, one if its cousins, a bird flu with the name H7N9, is causing some death and consternation in China. This strain has long been circulating among birds, but since earlier this year people have become ill with this respiratory virus, all so far in China. This week's issue of the New England Journal of Medicine (NEJM) published a review of the public health findings thus far. The review stated that up to now 82 people have been confirmed to have H7N9 in 6 different regions of China. Most of them were extremely ill, but that is largely because of the way in which they were identified; patients with severe respiratory illness were tested for the virus. Of these 82 patients, 17 have died (21%) and 60 remain critically ill. The incubation period ranged from 1 to 10 days, and those who died were ill for a median of 11 days. Four of the patients were poultry workers and 77% had known exposure to live animals, mostly chickens. This suggests that the majority of the cases are due to transmission from birds to humans. There were no confirmed cases of human to human transmission but in two families human to human transmission could not be ruled out. The concern is that eventually, through random mutations, H7N9 will get better at human to human transmission. Then, as in the swine flu epidemic of 2009, since the entire human population has never been exposed to H7N9, we will be a very large non-immune target. Like the first spark in a forest that hasn't burned in many decades, very rapid spread would be likely. 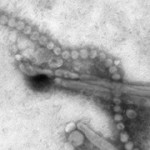 Yesterday the first case in Taiwan was reported, so the virus has spilled out of mainland China. Is it time to panic? No. Not unless you frequent live poultry markets in China. H7N9 has not been detected in people or birds in the U.S. American health officials are keeping a close eye on the spread of the virus. They are trying to determine how many people have mild disease from H7N9 to better calculate how lethal it is. (People with mild illness may not be seeking medical attention. If hundreds of people have had undiagnosed mild illness then the virus is much less deadly than if the only people who got the virus are the 80-or-so we know about.) They are also waiting for the first confirmed transmission from person to person. That's when all the measures that we saw in 2009 will be revisited: a new vaccine, reminders for people to stay home when sick, and despite official reassurances, everybody freaking out.